There hasn't been one in America in 50 years! 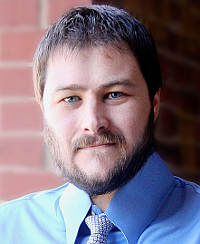 I’m the senior resource strategist at Angel Publishing. An event is unfolding that could be the biggest investment opportunity of 2018... and perhaps the biggest I’ve ever seen in my career. It’s about the development of America’s newest “blue gold” mine... a rare, sought-after metal that soared 150% in price last year. There hasn’t been an operational "blue gold" mine in the United States since 1968. And right now, you have a rare chance to grab a stake in this company’s history-making mine BEFORE it goes into production. Shares are trading for less than $2... but I believe they will rise considerably to $5, $10, and even higher in the coming months. This mine is expected to generate $1.1 billion in revenue for this tiny company. And it could be life changing for its early investors. The mainstream public has no clue about this. But this is a huge, historic event in the mining community... with the potential for historic profits. “Blue Gold” was hands down the hottest commodity of 2017. “Blue gold’s” price surged a whopping 150%... while the price of gold only rose 9%. And “blue gold” is only expected to keep dominating the commodities market in 2018. With Fortune 500 companies like Apple, Tesla, and Volkswagen clamoring for long-term supply deals. It’s set to be the first new “blue gold” mine to operate in the United States in 50 years. The project is fully permitted by the EPA... and construction is already underway. So what exactly is “blue gold”? Why is it the hottest commodity in the investment world? And how can you claim your stake in this company’s new “blue gold” mine today? I’ll answer all of these questions and more for you in this brief presentation. Shares of this company trade for less than $2, but I expect them to jump substantially... to $5, $10, even $30 a share or higher. Dubbed “blue gold,” this mysterious blue metal is used in magnets, aircraft engines, high-tech turbines, and even in cancer treatments. But what’s REALLY driving demand for it is the massive surge in the production of lithium-ion batteries. These batteries power your smartphone and your laptop. But they also power electric cars, homes, trains, submarines, battleships... even entire power grids. These batteries form the backbone of America’s newest energy revolution, with Elon Musk, the CEO of Tesla Motors, at the center of it all. His massive $5 billion battery factory in the Nevada desert, known as the Gigafactory, will produce more batteries in a year than were produced in the entire world just five years earlier. And while lithium grabbed the early spotlight in this space, it’s the dire supply of “blue gold” that is rapidly becoming the industry’s #1 concern in the production of these batteries. As Elon Musk recently said, "[there's] a little bit of lithium in there, but it's like the salt on the salad." Currently, the United States produces less than 1% of the world’s total “blue gold” supply! “Blue gold” demand from batteries alone has tripled in the past five years, and is projected to double again by 2020, according to minerals consultancy Benchmark Intelligence. Analysts are already predicting a 503% shortfall in the coming months. And now the current “blue gold” shortage trumps anything the world has ever seen. “Blue gold” prices have jumped a whopping 150% in just the past year. JB Straubel, the Chief Technology Officer for Tesla, recently admitted he is more concerned about the supply of “blue gold” than he is about lithium. For companies like Tesla and Apple to keep making billions of batteries for electric cars, cell phones, and laptops, it’s absolutely essential. “Blue gold” is the main course. If you missed out on the lithium boom, then this could be your second chance at huge profits. Play it right and this “blue gold” rush could make you a retirement fortune... enough to turn a $10,000 stake into $500,000 or more. Over the last year, lithium has been one of the hottest commodities in the financial world, driven by massive demand for lithium-ion batteries. 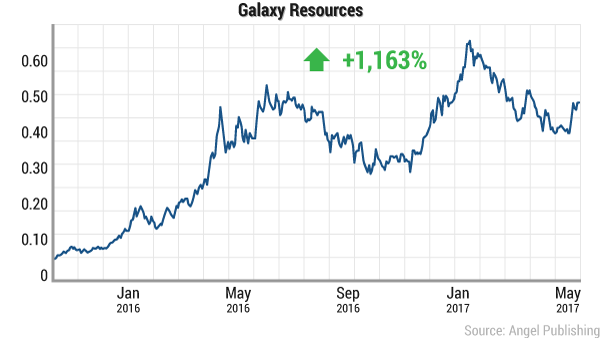 Galaxy Resources, an Australian lithium miner, which soared 1,163%. 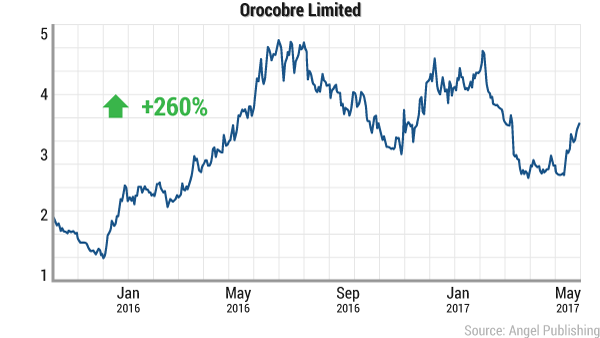 Orocobre Limited, which jumped 260%. 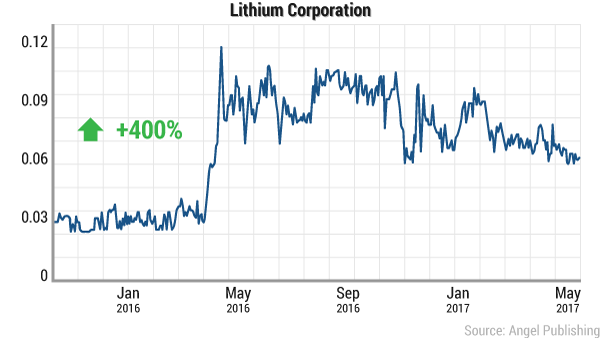 Lithium Corporation shot up 400%. 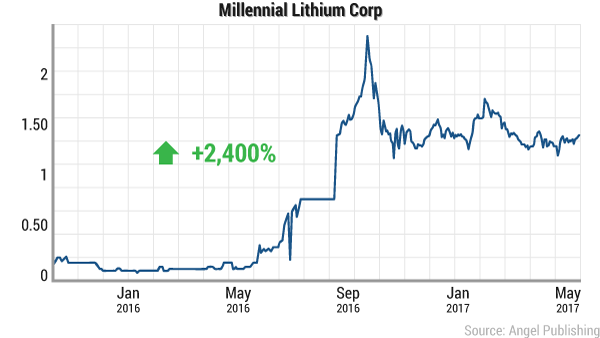 Millennial Lithium Corp jumped 2,400%. The global demand for lithium is expected to triple by 2020. Lithium is only one key component in the lithium-ion battery. According to Tesla founder Elon Musk, it’s as low as 2% by weight in some batteries. It makes up as much as 40% of the lithium-ion battery mix! "Lithium isn't the big worry for lithium-ion batteries"
In some battery types, “blue gold” can even account for 60% of the entire structure, far more by volume than lithium. “If you look at the constituents of a battery, [‘blue gold's’] the one that’s hardest to solve, in terms of supply,” says Julian Babarczy, head of Australian equities at Regal Funds Management. With lithium, there is no shortage of development projects. Tesla has already signed deals with several lithium startups. But with “blue gold,” there is a dire shortage of development projects, especially in safe mining jurisdictions. Over 60% of the world’s “blue gold” comes from the Democratic Republic of Congo, in Central Africa. Congo is an extremely politically unstable country with deeply rooted corruption. Child labor has become a major concern, with many children working in deadly mining conditions. Human rights organizations are pressuring companies like Apple and Tesla to completely ban “blue gold” imports from the Congo. They’re demanding that these companies secure all their supplies from ethical mining sources. Which is why Tesla Motors has repeatedly said it will source all of its “blue gold” from North America. North America produces only about 4% of the world’s total “blue gold” supply, with the U.S. producing less than 1%... not enough to even put a dent in the demand. And because it’s hard to get, it’s also gotten extremely expensive. 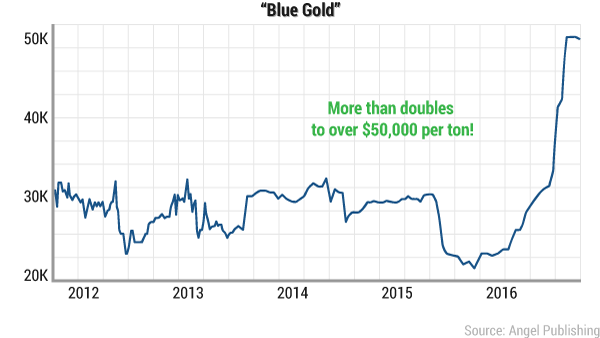 The price per ton of “blue gold” is up 150% in the last year... now sitting at a whopping $50,000 per ton! Prices are expected to continue soaring higher in the months ahead. Mass production of lithium-ion batteries will require more and more “blue gold” in both the short and the long term. The surge in demand will easily outweigh the supply available. According to Macquarie Research, demand is set to exceed supply this year by 885 tons. In 2019, that number rises to 3,205 tons. And by 2020, we are looking at a 5,340-ton supply shortage! All of this spells a huge opportunity for you by getting in right now on the bottom floor of this massive “blue gold” rush. Hi. My name is Keith Kohl. And I’ve never worked for a Wall Street bank or hedge fund. And parlaying them into huge gains for my readers. For instance, I recommended that my readers take a stake in a small lithium explorer called Dajin Resources. Those who listened to me could have banked 200% profits in less than 10 months. I also recommended that they scoop up shares in another company sitting on rich lithium properties in Nevada. Readers who heeded my advice had the opportunity to grab gains as high as 300% in just three months. We were able to capitalize on the lithium boom because I got them in early and we will continue to capitalize on it as it plays out. But I think the “blue gold” rush story will be even bigger. And it’s something that the majority of investors are overlooking. But now companies are waking up to the fact that this supply shortage will dwarf anything that the world has ever seen. Investors who act now could capture massive windfalls, the kind you could retire on tomorrow. 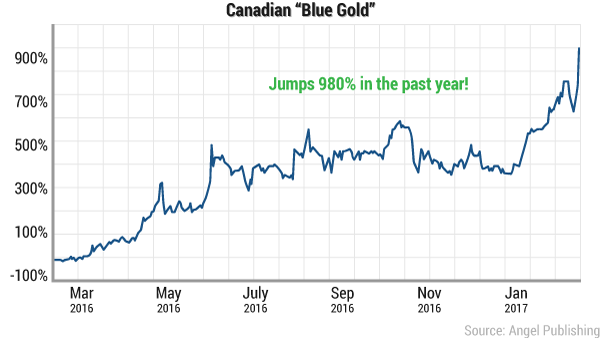 In fact, I’ve already watched one “blue gold” company from Canada soar 980% just in the last year. That’s good enough to turn a $10,000 stake into $108,000 profits. The demand for “blue gold” is soaring. Hedge funds are already buying up the physical metal in order to sell at much higher prices in just a year or two. They stockpiled a whopping 17% of last year’s production. Even Elon Musk has a difficult time securing a reliable source of this metal. With a target of 500,000 lithium batteries for 500,000 electric cars annually, the Gigafactory will need 78,000 tons of “blue gold” per year. And at last count, the U.S. only has 21,000 metric tons in proved reserves. The 500,000 lithium car batteries that Musk wants the Gigafactory to produce per year will swallow that up in a hurry. And that’s just Tesla Motors we’re talking about. Billionaire Mining Mogul To Elon Musk: "You’re Totally Screwed!" So recently, Musk visited Robert Friedland, a multibillionaire mine developer. Friedland made billions from his massive mineral discoveries in Northern Canada and Mongolia. And now he owns the largest “blue gold” mining operation in Australia, which is free of the child labor concerns currently plaguing the Congo. Tesla’s competitors will make this one of the biggest battles of the century... as many of them have plans for building "Gigafactories" of their own. This includes Chinese automaker Build Your Dreams (BYD). 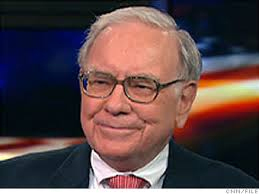 It is building electric buses on American soil and has the financial backing of Warren Buffett. "Imagine 1,000 gigafactories — that's what we'll be seeing in the coming decade," says The Australian Business Review. Supplies of “blue gold” are about to get squeezed tighter than they ever have been before. Companies around the world are waiting to scoop up the metal as soon as it’s out of the ground. And you can be in an early position to profit from the huge surge in demand that's about to be unleashed. Earlier I mentioned that Tesla has signed deals with several tiny lithium miners for supply... and these are companies that don’t even have mines built yet. That goes to show you just how tight the supply of lithium is right now... and how desperate companies are to secure supply deals. One of these tiny companies in Nevada they signed with soared 400% in a matter of three months. But here’s the thing: The supply of “blue gold” is even tighter! The U.S. produces less than 1% of the world’s total “blue gold” supply. And remember, both Apple and Tesla have said that all of their “blue gold” will now be sourced from North America due to the child labor concerns in the Congo. That’s why I’ve found a tiny company that controls some of the best “blue gold” in the resource realm... over $1 billion worth of it at today’s prices. And it’s operating right here in the good ol’ U.S. of A! 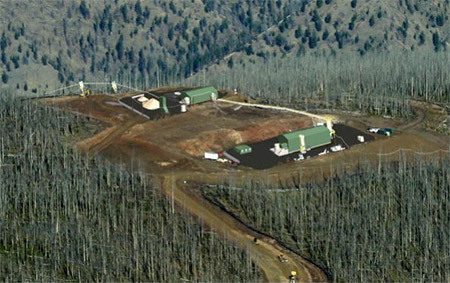 This tiny company’s property is sitting on the most prolific trend of “blue gold” mineralization in the United States. That makes this tiny company a prime candidate for a major supply deal... or even a major buyout! And you can scoop up shares of this firm — right now — for less than $1 a share! Investors who grab this opportunity now are likely to hit a mother lode. The rest will be kicking themselves for missing the chance of a lifetime. To help you immediately tap into the gains this company will post, I've written up a full research report. It's called, "How To Bank 1,000% on The World’s ‘Blue Gold’ Rush." I'd like to send it to you absolutely FREE and without obligation. As I mentioned before, my name is Keith Kohl. Since 2005, I've been running one of the most up-to-date energy newsletters in the country called Energy Investor. As a senior investment analyst here at Angel Publishing, I have been privy to some of the most obscure trends in the energy business that most people have never heard of. Keith: I'd like you to know how much I've appreciated your Bakken coverage over the years. I sold my position in NOG in Feb 2010 for gains of 261%, 1/3 of my position in BEXP in Apr 2011 for gains of 361% (and bought the wife a new car), and sold the rest of BEXP in Oct 2011 for long-term gains of 743%. Now holding a large position in your newest pick with unrealized gains of 365%. Thanks again! "230% in less than a year"
Your insight has been great: NOG, Gran Tierra is up about 230% in less than a year. "Safely paid off my daughter's entire tuition"
Hello Keith, I wanted to let you know that thanks to your Brigham calls over the last three years, I've safely paid off my daughter's entire four-year college tuition. Keep the picks coming. "Up 252%, 165%, and 101%"
Just wanted you to know how much I appreciate the hard work you do in finding the great companies for your readers. Currently I'm up 252%, 165%, and 101%. You've made a believer out of me. My focus has always been on North American energy and resource companies (primarily in Canada and the United States). As the years passed, I began to target long-term investments, including both larger infrastructure stocks and the bigger drilling players. My subscribers are thrilled with the results. So we'll keep it that way. I wanted to show my readers the NEXT Continental Resources, Rosetta Resources, or Petrohawk Energy — companies that have a huge amount of growth ahead of them and are capable of delivering potentially monstrous gains in a short time. This required a fast-paced service that delivered profit opportunities as they come — at any time. That's why I created Pure Energy Trader, a fast-paced energy service that gives you the chance to capitalize on potential targets wherever and whenever they surface. I cover resource and commodity stocks of all types. If there's a profit to be made in the resource realm, you can bet I'll be there. Like I said, these are explosive energy plays, so we'll be moving quickly here — whether it's a company mining an overlooked metal like "blue gold" or the next Bakken-like set of stocks, we'll be getting in on these plays... and then getting out for big gains over and over again. This "blue gold" boom is huge and historic no matter how you look at it. There are millions to be made by investors who sit on the right side of the fence. This wonder element has become the most sought-after — and fought-over — commodity on the planet. Frost & Sullivan predicts the lithium-battery market will hit $76.4 billion in 2020, a 20% to 25% annual growth rate. It's only a matter of time before the battery-driven demand spike sends the price of “blue gold,” and this company's stock, to the heavens permanently. This little $0.94 company is sitting on some of the purest reserves of “blue gold” in the world. And the wealth has just started. A lot of money will be made. I have documented everything I know about "blue gold" and how we'll trade on it for big gains... as well as how we'll make lots of money from this new energy boom in the years ahead. 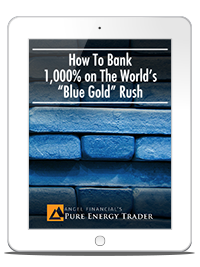 It's all in my latest (and what I consider to be my most valuable) report: "How To Bank 1,000% on The World’s ‘Blue Gold' Rush." This report tells it all: the name and ticker symbol of this company, the people behind this company, the companies looking to sign deals with this tiny firm, how many shares to consider buying, etc. And it's yours free of charge when you take a risk-free trial of Pure Energy Trader for the next 30 days. As I said earlier, I started this service to help my members make quick and profitable trades in the oil and energy markets. And the results have been nothing short of remarkable. Right now, you're probably wondering how much a fast-paced energy service like Pure Energy Trader costs. I tend to focus on some of the smallest and most liquid energy companies that are set to explode in a matter of weeks or months... the kind of potential blockbuster plays that can surface at any time. I've logged over a hundred hours of airtime and face time with CEOs, and I've covered nearly 15,000 square miles of America in search of these underground plays — especially in the Bakken, Marcellus, and Eagle Ford shales. Now add to that list the blockbuster “blue gold” play! With a fast-paced advisory like Pure Energy Trader, I'll be releasing data and recommendations to you directly from the field, seconds after I write them. You'll never miss out on an opportunity. Keep in mind, it's costly to run such a service... but it's worth the profits it could bring you. I will never water down your profits just to save a few thousand bucks in favor of on-the-ground research. That said, I believe Pure Energy Trader is an incredible bargain considering the amount of time and money that goes into each trade recommendation — and considering the returns these recommendations could generate in a short period of time. You can only experience these kinds of plays with timely and quick on-the-ground research. Even better, you’ll have 30 full, risk-free days to find out for yourself. New Shale Oil Field Could Be the Largest Ever Discovered in the U.S.
And large parts of its shale are so thick that it's like finding 140 Bakkens — or over 100 Eagle Fords — stacked on top of one another. Just one sliver of this massive basin could hold 20 billion barrels of oil, worth up to $900 BILLION. This single sliver is THREE TIMES the size of the Bakken oil field, which has been acknowledged as the largest unconventional oil field ever discovered. In total, the basin could hold as much as 75 billion barrels of oil. That would make it the second largest oil field in the world, behind Saudi Arabia’s legendary Ghawar field. In fact, there are more rigs currently drilling in the basin than anywhere else in North America. To give you an idea of how much that is, that’s about one-fifth of all drilling rigs currently in operation on the planet. That's why the play is the hottest in the world right now. And that’s why I want to tell you about one company that has been there since the beginning — and is already selling its oil to the market. It controls nearly 60,000 net acres of the basin — enough land to blanket the entire city of San Francisco three times. As you read this, the company is selling its oil into the market. No wonder insiders have been buying the company's stock all year. You can buy the company’s stock — right now — for less than $15 per share! If history repeats itself (and it almost always does), this $15 driller should be trading 10 times its current per-share price by the time you cash out. Starting today, I want you to have every bit of access to Pure Energy Trader risk free. Quick Profit e-Alerts — Get flash updates from the energy sector on the latest moneymaking scoops from my profit alerts. These obscure recommendations cannot wait another minute; they are delivered straight to your inbox seconds after they're written as these profitable opportunities arise. Regular Portfolio Updates — You'll know exactly what's happening with each profit-making play in your model portfolio with regular updates, any news that will send the stock soaring further, and when to sell for maximum profits. Members-Only Pure Energy Trader Website — You'll receive a unique username and password to my secure online platform for members only, where you'll find my no-nonsense research reports, commentary, picks, and current portfolio. And you'll get fast-track commentary on how to get the most out of my service. Access to VIP Service — A subscription to Pure Energy Trader qualifies you for VIP service. You can contact the VIP team with any questions at (844) 310-4115. 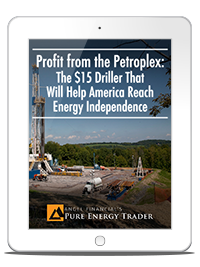 “How To Bank 1,000% on The World’s ‘Blue Gold’ Rush” and “Profit from the Petroplex: The $15 Driller That Will Help America Reach Energy Independence” absolutely FREE of charge. And your free reports are yours to keep — whether you decide to cancel your trial run or subscribe for decades... until you don't need any more money. But remember, for this particular opportunity, you must make your move now. I want to get you in on the bottom floor of this “blue gold” mania by owning a world-class miner that is trading for less than $1 a share. If you're still with me, I think you realize just how big this opportunity is. Over the years, I've made people absolute fortunes. I could easily charge $5,000 for my research. Wall Street boutique firms charge that much (and more!) for their research. And you'd need at least a million dollars to even start investing with some of them. In fact, left to hedge funds alone, would you even be able to get in on the latest and most profitable deals of our time? Truth is, I know exactly how much I could charge for the kind of research we publish. But I'm not going to charge anywhere near that much. It doesn't make sense to charge an arm and a leg just so 10 people have access to information that stands to change their lives. For this reason, just this one time, a whole year of Pure Energy Trader will cost you just $1,499. I believe this is an incredible bargain when you consider how just one of the opportunities we cover could pay you back several times over, in no time at all. And, of course, you're 100% covered by my no-risk guarantee. But I’m afraid I can’t keep the books open on this deal forever. Because a few of the juggernaut companies I’ll be showing you have smaller market caps, I must be careful how many readers find out about them. Only a small number can get in on this at any time. It’s first come, first served. For example, the tiny "blue gold" company is among the smallest recommendations I’ve ever made. I must be careful how many readers find out about it. I’m concerned that the stock is TOO small and any big influx will blow share prices up... ruining the opportunity for everyone. And we're not in the business of driving stocks higher — we're in the business of helping readers ride them to the moon. So I’m putting a hard limit of 575 on the first run of reports. Once we give out the 575 reports, we will IMMEDIATELY shut this offer down and see how the stock performs. I hope you’re already in position when that time comes! So click the "Subscribe Now" link below this presentation to get started. Once again, you'll have 30 days to test-drive my research. And if you feel it's not for you, let me know. I will gladly refund your entire subscription minus a small 10% tire-kicking fee. Then a trial subscription to Pure Energy Trader is a no-brainer.